Before I could even blink the next BMG training course was here. 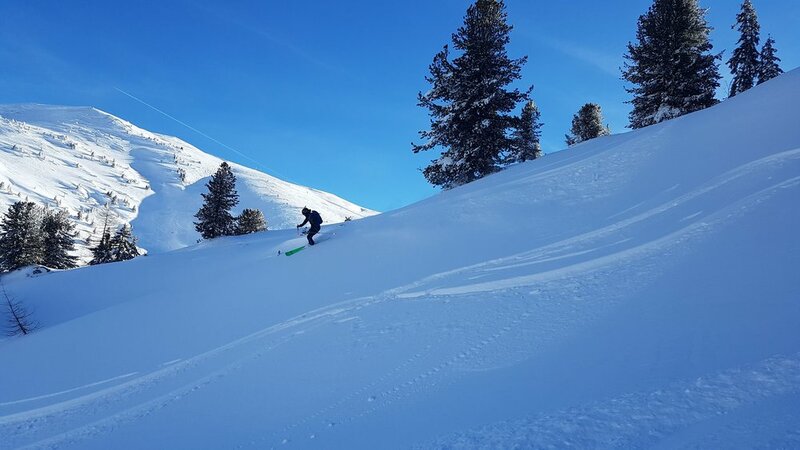 It was the Ski touring training based from Arolla in Switzerland so I managed to get a couple of days skiing to acclimatise before the course commenced. The week was brilliant and headed up by 3 brilliant guides Graham, Jon and Ric. It was a very chilled atmosphere and I learnt a great deal about ski guiding and it is definitely something I look forward to doing more of. We split the week into two...a 3 day hut to hut tour then and 2 day hut tour looking at all aspects of ski guiding and dealing with issues that we will come across when we guide. Skinning up towards the hut...can you see it? After the ski course we were asked to carry on skiing to consolidate what we have learnt. I Skied in Austria for a week before heading to Chamonix to link in a bit of climbing and skiing. Lou and I climbed the North Face of Les Droites which was cool, my second time up that face. We then did a few days skiing and valley cragging getting to know some of the local areas for the coming seasons. Im back in the UK now and will be here for two months before heading back out to the alps for the summer Alpine training...it is going so fast! I think I can just about keep up! Feel free to get in touch if you fancy some climbing in Scotland over the next couple of months. Damn right it is! Just looking out the window is enough evidence to suggest we are fully embraced in my favourite season of them all. It seems like a silly question for mid January but as I have no winter routes under my belt so far it feels like winter hasn't even started yet. A result of poor weather and condition's have meant I haven't been out climbing but also because I have been focussing on the next phase of inductions for the British Mountain Guides scheme. 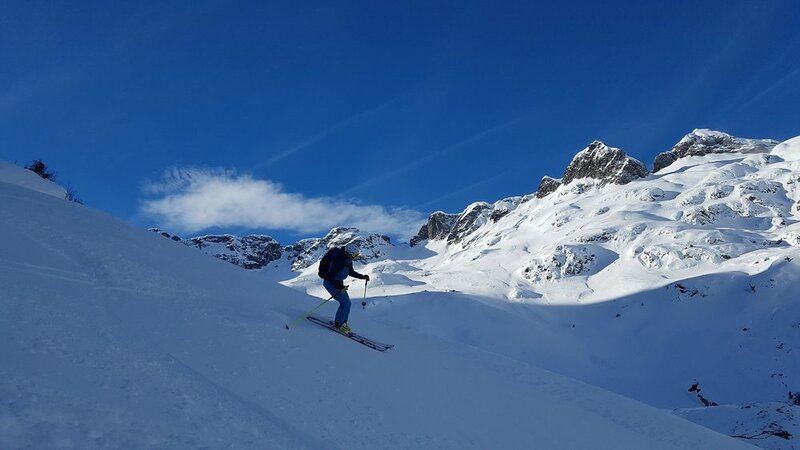 Over the last two week I have been in the Alps working on improving my skiing technique, proving that I can ski at the required standard and then followed up with a 5 day avalanche course. We started of at a brilliant resort in Leysin in Switzerland for a 3 day ski technique course ran by Alex and Ivan. These two guys are something else on ski's. Its hard to describe how good they are but imagine skiing down as fast as you can, then look ahead and you will see Alex skiing backwards giving you tips on your technique as he weaves through the crowds on the piste...one one ski as well! That is what 30+ years on skis will do for you. He is also a coach for the Swiss ski teams. We were in good hands. Ivan strapping his boot up for an intense warm up! Our group has 12 members, all of different abilities and backgrounds, some climbers, some instructors and some pro skiers. Everyone was picking up good tips and knowledge off Alex and Ivan no matter what their ability. After the 3 days in Leysin, I went to Samoens in France with Calum for two days skiing. Unfortunately it was raining at all levels so we just did one day skiing and then had a late start and headed over to La Grave for the rest of the trip. Who knows how to ski? Our first day in La Grave was the Ski Induction. A one day assessment of our skiing ability to make sure we haven't falsified our logbooks and that we are a suitable standard for the scheme. Phew, we all passed and can continue onto the next stage of the scheme. After we all passed our assessment we then went on and started a 5 day EAS avalanche course run by Mark Diggins (Top Man at SAIS), Bruce Goodlad (BMG Training officer), Nick Parks (BMG) and Peirre (Local Guide). A collected wealth of experience and expertise meant we had a very informative course and we all took a great deal away from it. I always believe it is worth doing as many avalanche courses as possible. Its getting cold, lets go! Not only were we digging snow profiles and writing avalanche reports, we were also looking at safe travel through the mountains with groups and on skis. So during the week we went on two mini ski tours looking at route choice, hazard identification and group management amongst many other topics. Hands up for breaking trail? So all in all, a great couple of weeks in the Alps but to be honest I am really glad to be back in Scotland. The snow is here, routes are in conditions and I have a few days off before work really kicks in. More pics HERE. One another note, I am very sad to hear two local climbers who I knew lost their lives in the mountains of Glencoe yesterday. Thoughts and prayers go out to their families at this very tough time. Rest in peace Simon and Joe, two very enthusiastic young lads. I did think I should stay out for longer but on reflection it is good to come home and get into the Christmas spirit. You know...wind and rain...very Chrismassy! Fortunately whilst I was away this last week we had fantastic weather in and around Chamonix where we based ourselves for the 9 days. This trip had been in the pipeline for quite a while as I had booked onto a Off-Piste Performance with the highly decorated Alison Culshaw. 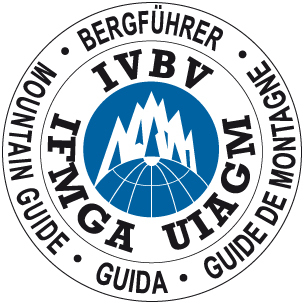 As I am now working my way through the BMG process, I want to make sure that my skiing is up to scratch and I don't catch an edge through the process. We had a great week of skiing with friends at several different resorts; Le Brevent and Flegere, Grande Montets, La Thuile and Verbier. During the course we covered both piste and off piste terrain looking at drills to work on weaknesses and iron our any bumps in our ability. A great way for anyone to start their season with a few top tips from the experts. 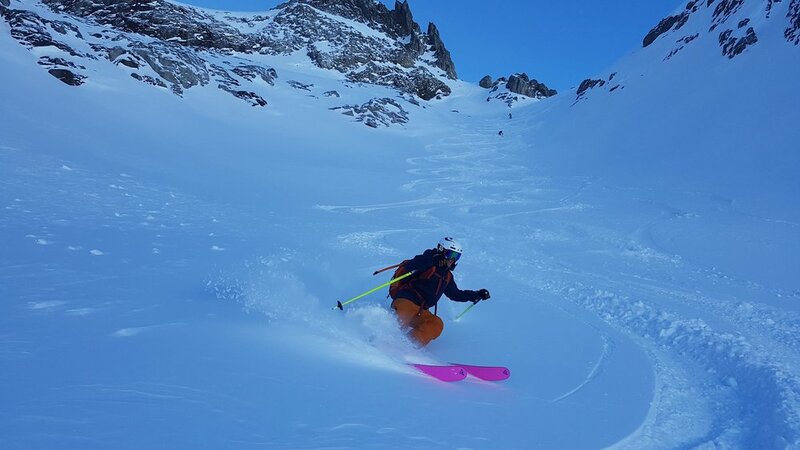 The Alps have lacked their early season coverage but it resulted in very spring like snow, a little bit of rock avoidance but generally very good snow. Some routes were getting climbed in the mountains in the Alps which led me to get psyched for climbing and getting back to Scottish winter. Unfortunately, I have no winter ascents under my belt just yet but hopefully will get a leg stretch soon. I feel as I am going through a little transition with this Alpine hit. I'm starting to look forward to reaching for crimps rather than swinging into ice, walking in trainers rather than sliding on ski's. It does feel a little premature as there is plenty of snow and ice in the mountains but maybe 4 months on snow is enough for this season. Since leaving Scotland the trip has been fantastic. I drove out to the Alps with my good friend Ben Cooling, he is a bit like a strawberry blonde Duracell bunny. He wanted to do everything in the Alps! We had 10 days before he returns home. From leaving my mums house in Cumbria, we drove flat out to Dover, then non stop to the start of the Grand Paradiso Ski tour. In 25 hours from leaving Cumbria, we had skinned up to the Sella Hut to start an amazing 6 day ski tour. In the Sella hut we met Calum and Jamie who had the same idea so we joined forces and completed the 6 day tour together, driven on by Calums endless cheese related jokes! I had been on this tour a couple of years ago but bailed due to bad snow conditions, this time I was keen to complete. The tour started with some very difficult conditions, high winds and knee high sastrugi (wind erosion). Word had got around that several teams hadn't made the summit of Gran Paradiso (4061m) so we hoped our attempt the next day would bring results. Fortunately the wind eased, the clouds parted and the summit was there for the taking. A brilliant day and a great ski down. This was our high point of the tour, everything we did was slightly lower but we were blessed with fresh snow every night. 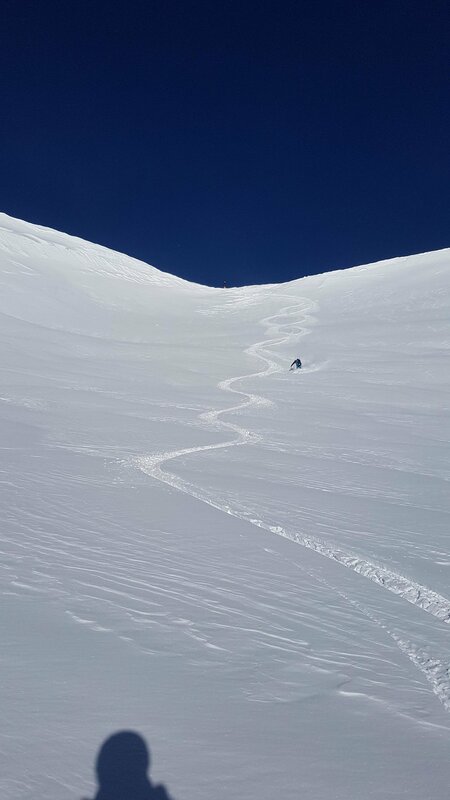 Each of the following days we had fresh tracks, Calum and I hit some sweet jumps and the final day completed the best week of ski touring I have ever done. I can't wait to be able to do a week like this as work! Great company, great condition's and a brilliant tour. After our week in Italy, Ben and I headed to Chamonix to make the most of Ben's last 4 days. We thought no need for a rest day, lets just get up high again and climb Supercoulior! We were psyched, first in line for a lift up the Aiguille du Midi, we had ski's, climbing gear and some grub. We also met up with Uisdean and Tim. All we needed is for the lift to open. Guess what!...it didn't. Damn it, we had to have a rest day. New plan had to be formed! We decided to make the most of the good weather by heading up to Argentiere Hut and having 3 days climbing from there. We all made use of mechanical uplift and then went straight into the Frendo-Ravenell Gully (TD-) which was a brilliant 540m route with abseil descent. Perfect for getting up to the hut in time for dinner! The next day we all agreed on doing a 'Grande Course'. Uisdean, Ben and Tim were keen for their first long tick and I was keen for my 7th so we opted for the 'Swiss Route' on Les Courtes. A great day which only took up 5 hours as 2 roped teams. When we returned back to the Argentiere hut to find that my ski boots, rope, cams and wires had been removed from the hut! WTF!! It turned out that my stuff had been scooped up by a film crew and taken for a helicopter ride down the valley! I needed to get this back ASAP. Fortunately the guardian of the hut lent me his ski boots and despite being a size too small, we still managed to ski down. I retrieved my kit and with one day to spare before Ben fly's home, we headed up the Aiguille du Midi and climbed the Perroux-Proffit Gully (TD) before driving Ben to Geneva. Despite a few hiccups, it all went well, we were active for 9 out of 10 days and had some fantastic days in the mountains. The following day Uisdean and I met up with Paul Swail and John Macune for a spot of relaxing sport climbing, to be honest we only did 3 routes as we were all pretty tired from the last few days. For us all, it was back to the weather forecasts, back to the drawing board. Our research showed that the weather looked good so John, Uisdean and I planned for an ascent on the Colton Macintyre on the Grande Jorasses. Surely 3rd time lucky for me on this North Face?! We took the afternoon lift up to the Aiguille du Midi and skied into the face, carrying all out climbing equipment, bivi equipment, winter boots and plenty of food. We dug bed space below the face, away from any fall lines, brewed up and settled for the night. I remember thinking that this time I would make it to the top! Everything was falling into place in the morning, we started on time and we were all feeling pretty fresh. We made good progress into daylight and found ourselves at the midway point...at this point we hit our brick wall! The 90 degree ice was cruddy snow. No placements, no ice screws. OK not to worry, lets take the harder variation...cruddy snow. No placements, no ice screws. I couldn't believe it! Why does this face not let up for me!? After several attempts we decided to call it a day, retreat back to our ski's, retreat back to Chamonix. I knew this was going to be my last window for a big route on this trip and as I am writing this I am now on the wire...I want to climb another big route but maybe I will save it for another time, should I just go rock climbing or should I endure another big committing North Face...only time will tell! Either way, I'm sure it will be fun. Chadders doing what he does best....looking cool. The trip started with a random meeting of Chadders in the airport, at 6am in the morning we didnt make much chat but we did agree we would Ski in the afternoon when we got to Chamonix. After feeling a little more awake we grabed our kit and hit the Grand Montet, bumping into Andy Nelson, Mike Brownlow and Kenny Grant. We had a great day hitting the off piste from the lifts and a perfect warm up for me. From Cham, I hooked up with School friend Kirby and Ali for 3 days in the Ecrin. Conditions started pretty wild but soon improved form white out and windy one day, clear but windy the second then calm and clear the third day. Perfect! Proper windy, no ridges today! Clam and clear...climbing, ridges and steep descents on ski's. Kirby leading up to the summit crest. From the Ecrin, we headed back to Chamonix and were based there for the rest of my trip. From here I did several day tours seeking out some great snow, steep descents and some great summits.